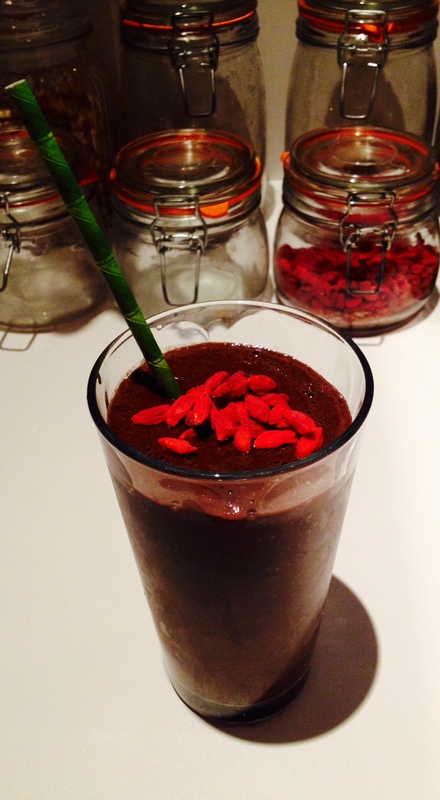 Start Your Year Right With A Nutrition-Packed Smoothie! What is it with this sudden smoothie craze? Well, while some of them look, smell and taste unlike your usual breakfast or snack, they’re full of very beneficial vitamins and minerals, and blending means you can pack lots of nutritious foods in to one big glass. This smoothie is absolutely full of stuff to give you a boost after a time of the year when we might not have been so health conscious. It’ll also really help if you’re feeling hungover after the new year celebrations! A mint chocolatey smoothie with a bit of a kick. Bananas contain high levels of tryptophan, which is converted in to serotonin – a ‘happy mood’ neurotransmitter, helping to lift your mood if you’re feeling low. They also regulate blood sugar levels, which is handy when your blood sugar levels are likely to have crashed the morning after the new year’s eve party, nd are also very good for calming stomach problems. A handful of fresh or frozen berries: Blueberries, blackcurrents and strawberries are high in antioxidants so go for them if you can. Antioxidants help to repair and maintain damaged cells. Berries are known to help boost memory (even if you’d rather forget what happened last night! ), improve circulation, and blueberries in particular are anti-inflammatory. Lots of spinach; I use frozen spinach balls (about 3 or 4) if you’re using fresh spinach, use a couple of handfuls. Spinach is full of vitamins and antioxidants. Including lutein which can improve eyesight, and vitamin K which is essential for bone health. Plus, we all know that eating green stuff is always going to be a healthy choice…. A few inches of cucumber. Cucumbers have a very high water content and are therefore very hydrating – exactly what your body needs when you don’t feel your best. (Did you know, the pounding headache you may feel when hungover is actually blood trying to pump through you dehydrated brain!? Nice….) Cucumbers also help to flush out toxins and help to reduce bad cholesterol. You might as well save a little to put on your eyes too, as placing slices on the eye lids is cooling and does actually help to reduce bags under and puffiness. Not only is it sweet and warming, cinnamon is excellent at balancing blood sugar – so good infact, that you can even get cinnamon supplements to balance blood sugar. Nutmeg can help stimulate the brain, helping to relieve stress and fatigue. It is a staple in Chinese medicine to aid in stomach pain, and – essential for today – it helps to cleanse the liver of toxins! Ginger aids in digestion and is great at calming nausea. 1 tbsp raw cacao. Yes, raw chocolate! It’s actually full of antioxidants and give you a nice mood boost when you’re feeling not so great. A sprinkling of cayenne pepper. Molasses is energising and full of nutrients. Extracted from pure raw cane sugar, molasses is actually a superfood sweetener, full of iron and calcium. Regretting last night’s pizza binge after a few drinks? Lecithin aids in the breakdown of fat, preventing it from sticking to artery walls and helps play a vital role in the absorption of nutrients from other foods. Important for preventing colds at this time of year – and especially important now, as the sugar from the alcohol you may or many not have drank last night will have temporarily lowered your immune system – clementines and oranges are full of vitamin C.
A nice citrusy boost, lime helps to rejuvenate skin when it isn’t looking its best, and stimulates digestion. Obviously, the water helps to hydrate you and cool the body. Pommegranate juice does the same and is also very high in antioxidants – a glas of pomegranate juice actually has more antioxidants than red wine, green tea and blueberries! Add everything to a strong blender and whiz until you’re left with a smoothie-like consistency. Sprinkle with gogi berries for a superfood iron and energy boost, or dessicated coconut for a dose of healthy fats and so many other health benefits that I may as well write a whole other post about it. Drink this, feel good, and know that your year is off to a very healthy start!